October! Yes, October!! How this wonderful season zipped by for us. 1 more Summer Share to go and we are amazed. Slowly it is setting in that our growing season is winding down. We are grateful we have not had a hard frost and we keep harvesting a bounty out of the gardens and this mild weather always makes clean up easier and more enjoyable. 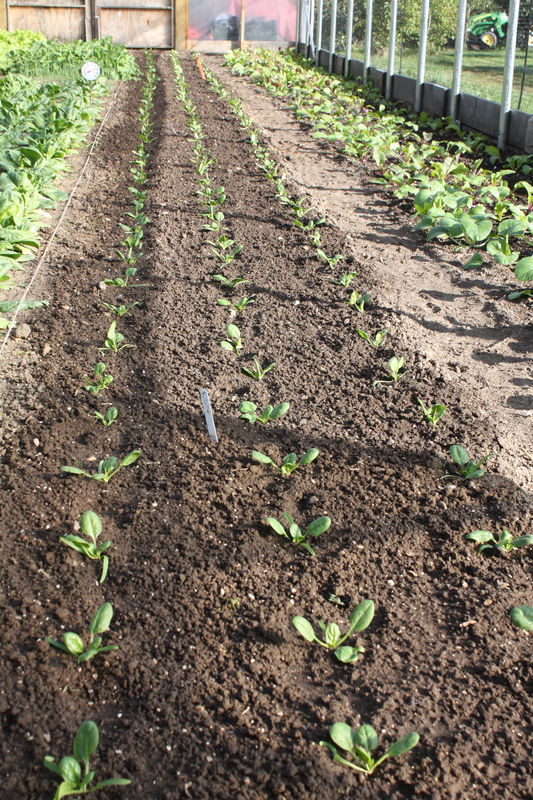 Another long section of spinach transplanted into the hoop house for wintered over spinach eating starting next March. With the shift in the season our duties shift as well to some fun seasonal work. We had a great day with our yearly Exterior Autumn Transformation at the DelBar in Wisconsin Dells. My favorite job of the year! 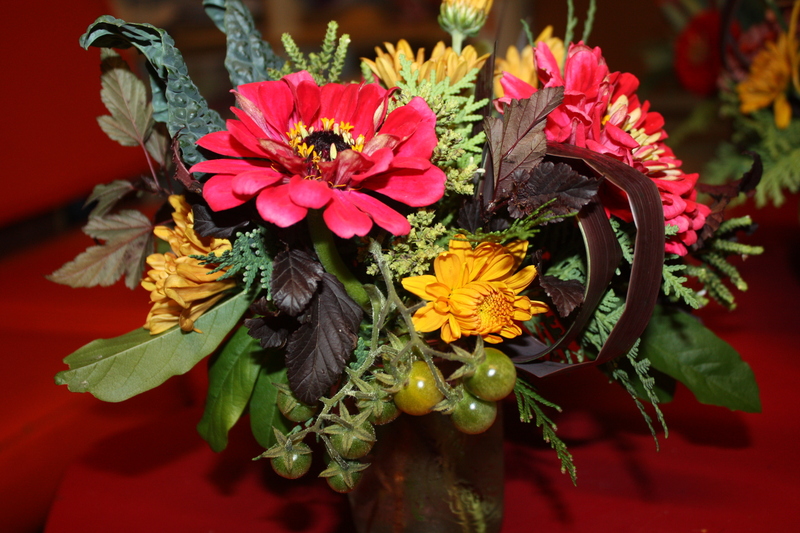 Fresh Flower table bouquets were created for a Harvest tasting at Windmill Pizza in Sauk. 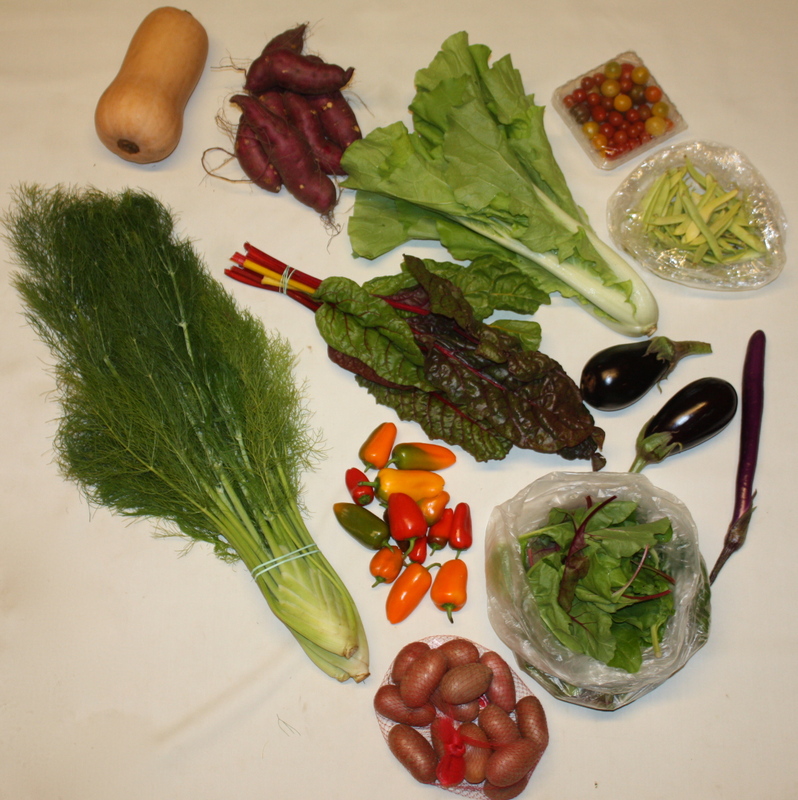 We also contributed produce to this wonderful meal. We were able to attend and the tasting was delicious! 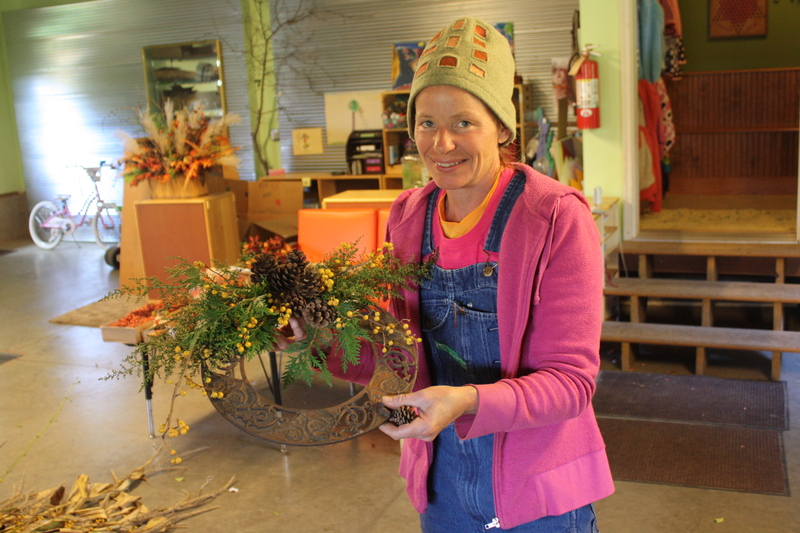 Autumn Garden Bouquets for the Harvest Tasting at Windmill Pizza in Sauk. 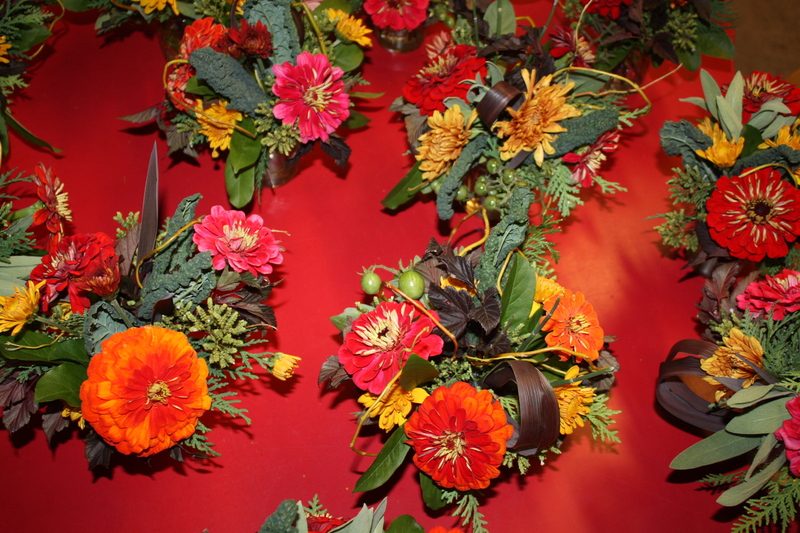 I added green cherry tomato sprigs, kale and herbs to the bouquets. Perfect for a Harvest dinner. And wreath making has begun! Our metal frames arrived and custom orders for Thanksgiving Florals and Autumn (and Christmas Evergreen) wreaths are coming in. It is fun to return to this type of work after a Summer of garden duties. A different way of thinking and it is energizing. We will complete the potato digging this week and hopefully all the sweet potatoes will come out of the ground too. We need to move on from this duty and get the gardens put to bed. The tomato plants need to get pulled down and trellises removed. Our summer crops need to get cut from the garden and taken to the compost and garlic needs to get planted in the next week or 2. We need to hustle as there is nothing worse than trying to pull frozen (or slimmy) plants from the garden if we wait too long. Scott starting to pack the shares this morning. 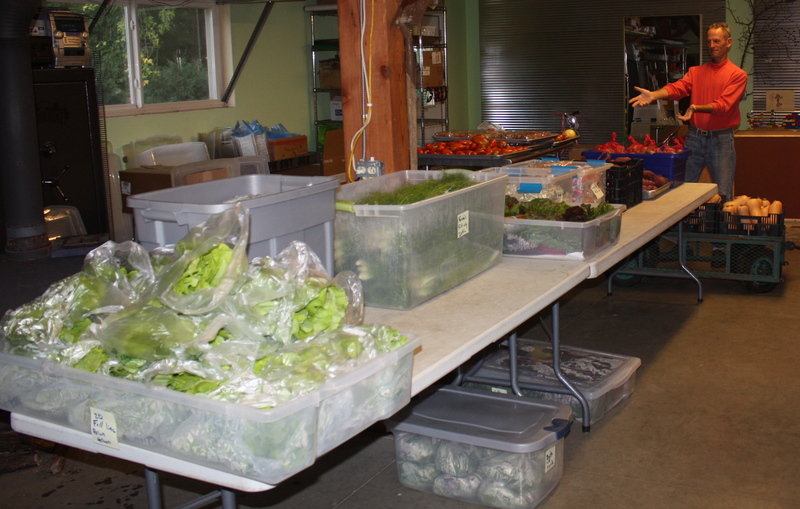 Next week is the last share pick up/delivery of the Summer CSA Season. 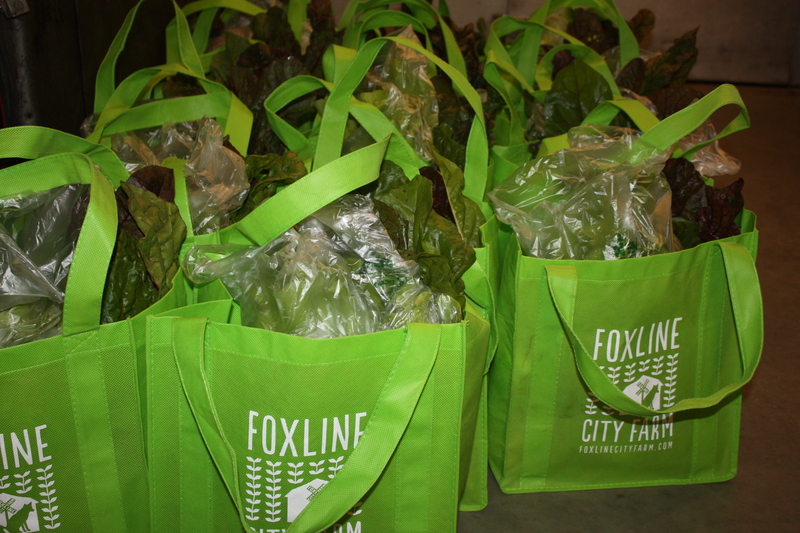 Please return all bags and reusable packaging material. Every other week share members surveys are on the clip board at drop off sites and on cooler door at Baraboo pick up. Lots of treats in the shares this week. Enjoy! 595 pounds harvested from the garden. Snack Packs all ready to go home…..
Butternut Squash-I love the return of Winter Squash this time of year. A perfect midsized squash for oven roasting, cubed in a stir fry or for a creamy soup. 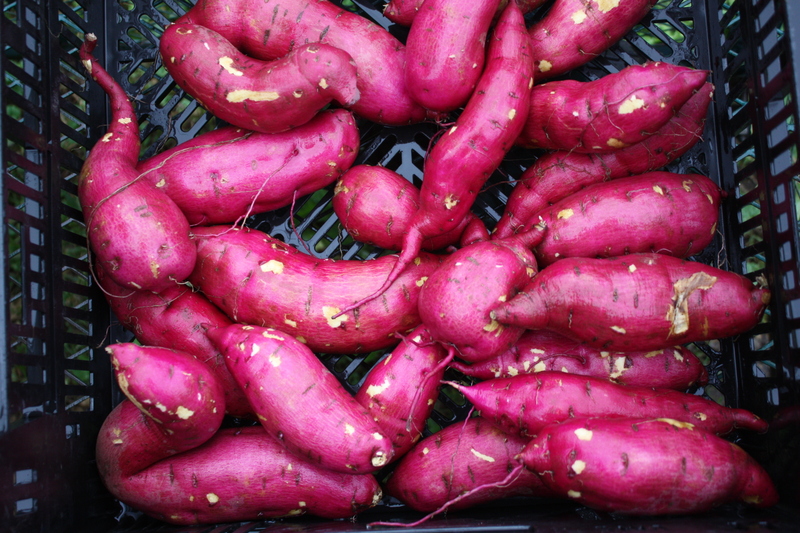 Fingerling Potatoes-A delicious late season potato. Great crop for us this year. Delicious roasted or hold their shape well in soups and stews. Fingerlings washed and ready to be weighed out for the shares. 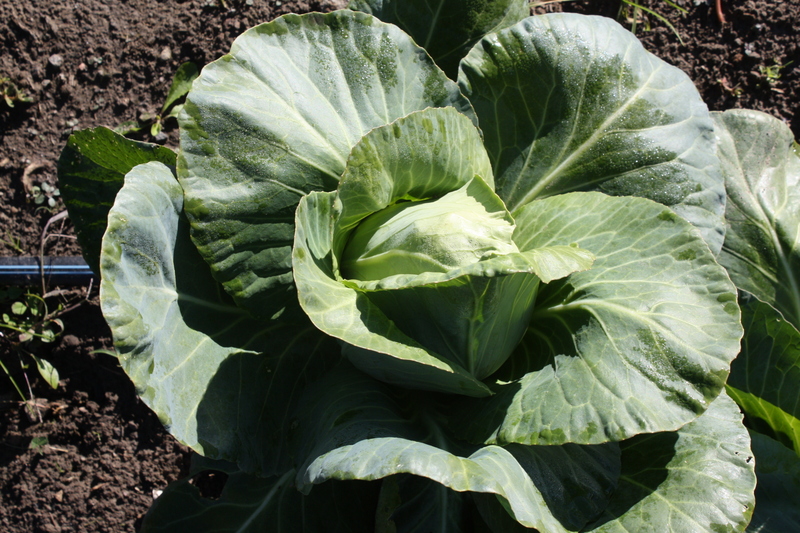 Cabbage-The variety is called Caraflex. Excellent sweet, mild cabbage flavor. Perfect for salad, slaw or cooked dishes. Asian Green-Tokyo Bekana. A pretty lime green mini chinese cabbage. Enjoy fresh in salads or add at the end to a quick stir fry. Tokyo Bekana ready to be harvested. 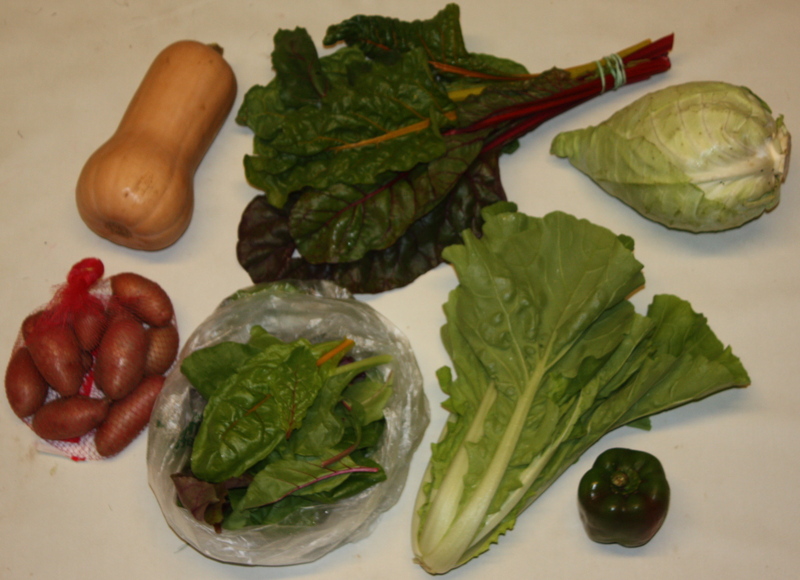 Beta Mix-We love this greens mix. Grows well only in cool temperatures. 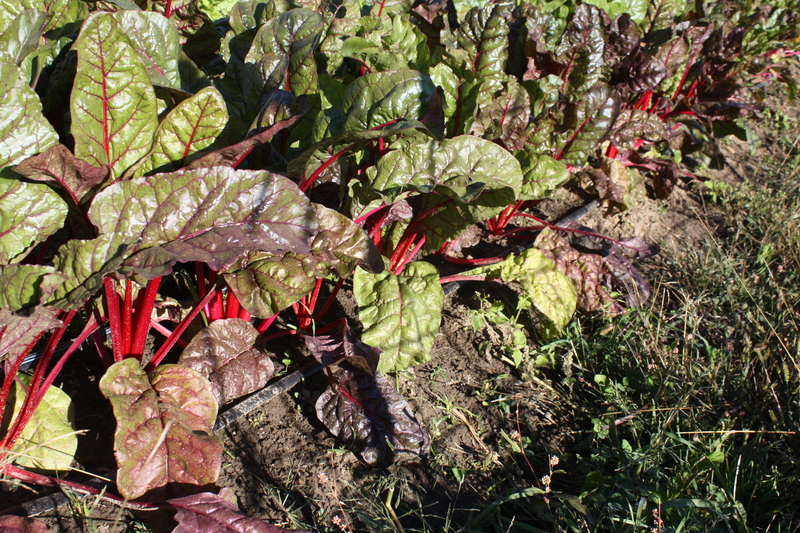 A great combination of assorted beet tops and mini swiss chard. 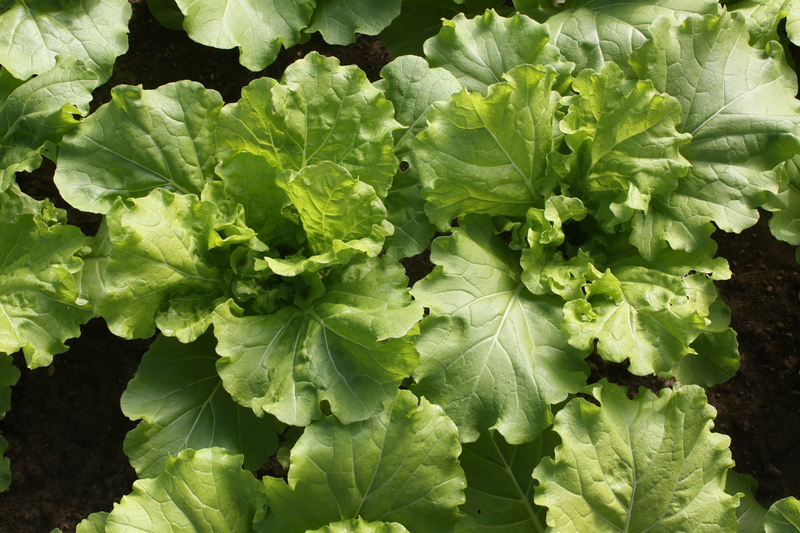 It is amazing fresh in salads but also can be wilted down as a quick side. Sweet Peppers-Again! 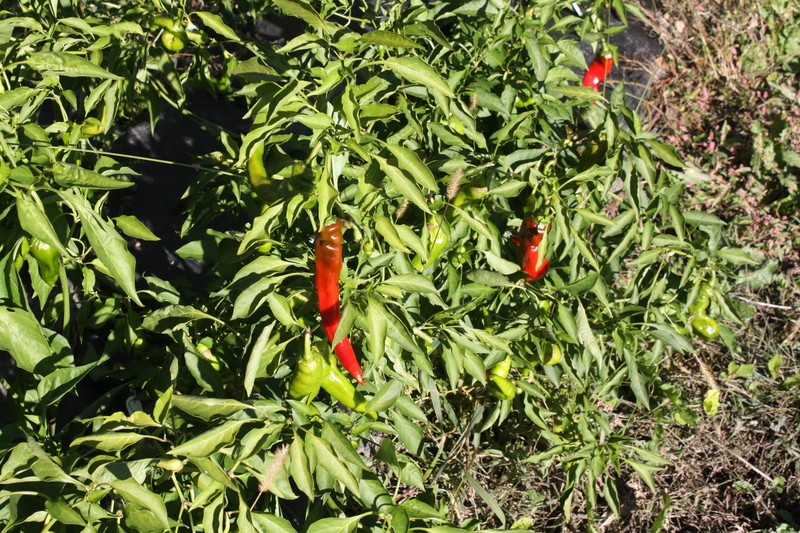 We picked a few from our fantastic pepper crop this year and 1-2 will appear in your share. This is the end of the pepper harvest for the year. 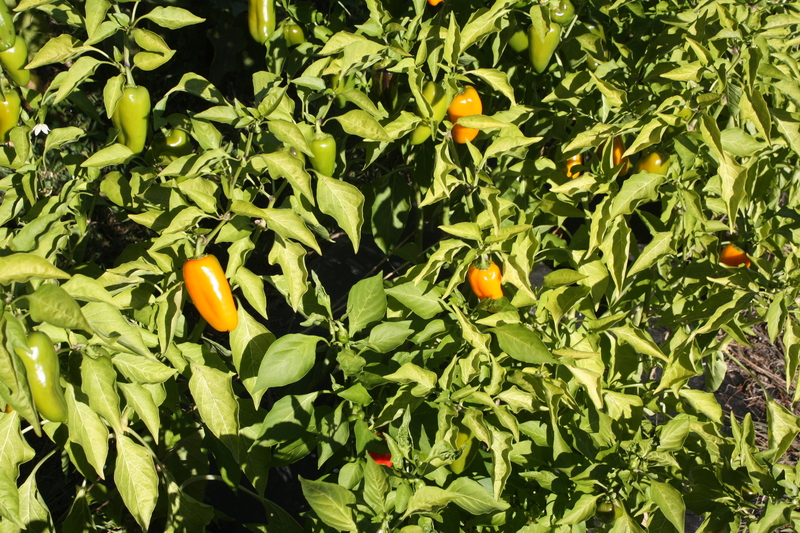 Pepper plants still producing…It’s October! Swiss Chard-The first cutting off our late summer planting. We replant our Swiss Chard mid summer as the new plants provide sweet tender new growth. Eat leaves and stems fresh or stir fry. Tastes great with scambled eggs. 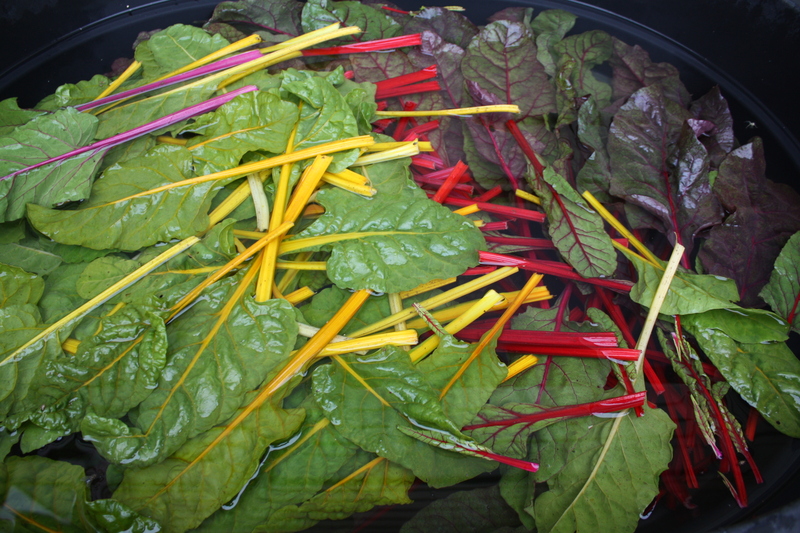 Swiss Chard in the washing tank. 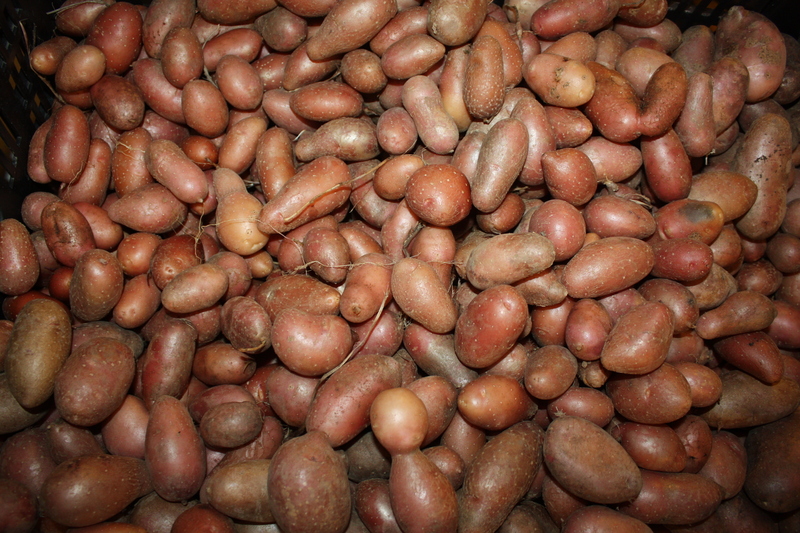 Portioning out the fingerling potato harvest. Sweet Potatoes! !-Here they come and they are wonderful! We dug a few this week for the full share and even right from the field they are sweet. We ate some for dinner this weekend. Sweet potatoes “sweeten” up with curing. Keep them in a warm location for storage-NOT in your refrigerator. 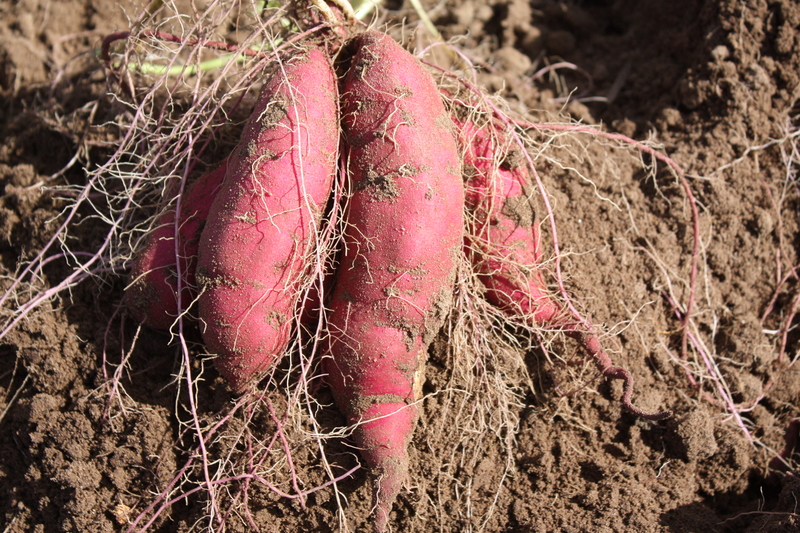 Sweet potatoes in the field. Tokyo Bekana ready to be cut. Mini Sweet Pepper Mix-Another bounty this week of this little gem. A nice sized bag for all of full share. The end of the pepers for the season. Mini sweet pepper plants in the garden. 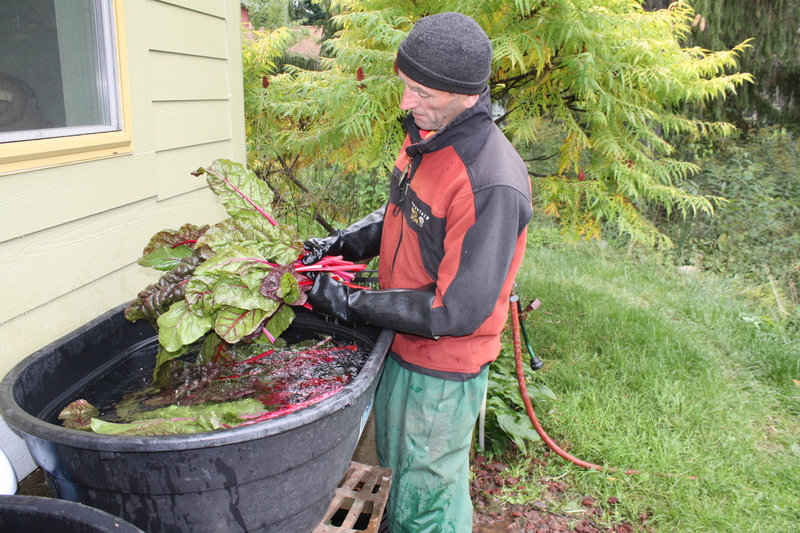 Scott washing the Swiss Chard. Beans-The last harvest of the tasty romano beans. So good lighty steamed. Fennel-A final harvest to of this crop. Great shaved in fresh salads or wonderful flavor roasted. 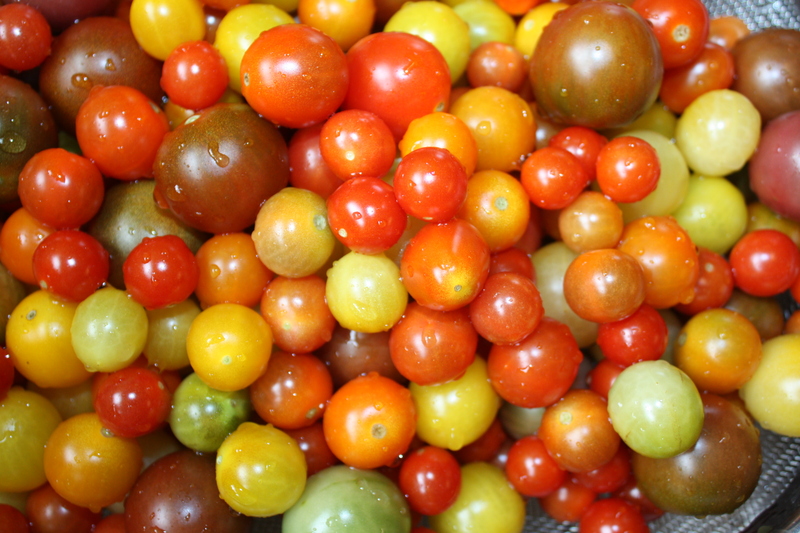 Cherry Tomatoes-This is it for the season. The end of our great tomato year. Enjoy the final taste of garden cherries until next July….. The end of the sweet chery tomato harvest. Eggplant-A few in every share. Final harvest of the season. 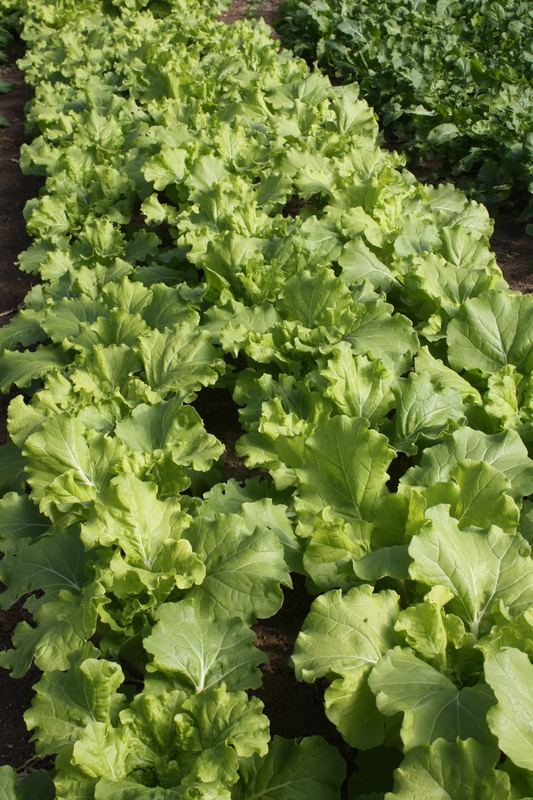 BEST GUESS FOR NEXT WEEK-LAST SHARE OF THE SUMMER SEASON….HONEY, SQUASH, SWEET POTATOES, POTATOES, LEEKS, MIXED GREENS, CHINESE CABBAGE, BRUSSELS SPROUTS, CELERY, KALE, ARUGULA, RADISHES AND MORE……..